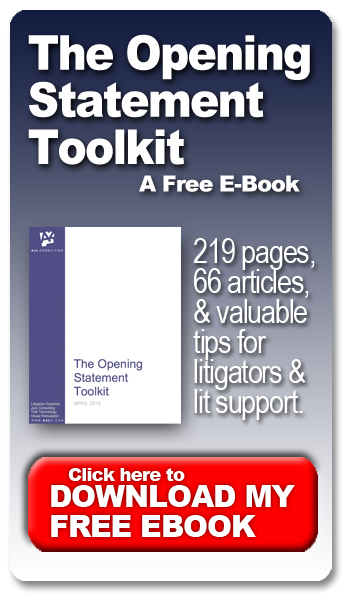 I'm absolutely thrilled to announce the release of A2L Consulting's latest free litigation e-book, The Opening Statement Toolkit. You may download this book with no strings attached right now by clicking here. In this 219-page book, you will find 66 articles curated from A2L's massive collection of posts related to litigation and persuasion. Each article relates to opening statements in some way. From organizing the opening to the use of storytelling techniques to persuade, the book contains an amazing array of tips that will prove valuable to the novice litigator and the veteran alike. At A2L, we firmly believe that the opening statement is the most important part of a trial. If you win the battle of opening statements, you stand a pretty good chance of winning the case. This is true since many jurors make up their minds during opening statements -- or they at least develop a view of the case through which they will perceive all of the subsequently presented evidence. At A2L, we frequently have the opportunity to help trial teams develop their opening statements. Perhaps more importantly, we also have a chance to help test what works in opening statements. There are often surprises, and good science is still emerging about what works. The articles in this book are intended to help you develop the best opening statement that you can. Often, the opening statement is when jurors form strong opinions about the ultimate winners and losers in a case — but it does not have to be that way There are best practices for affecting judge and juror decision-making, and many of these are described in these articles. Among the valuable articles in the book are: Five Ways to Maximize Persuasion During Opening Statements; How to Structure Your Next Speech, Opening Statement or Presentation; Five Essential Elements of Storytelling and Persuasion; Six Reasons the Opening Statement is the Most Important Part of a Case; and How to Emotionally Move Your Audience. It is easy to download the book and have it at your fingertips, and it’s a free download. Your opening statements will never be the same.